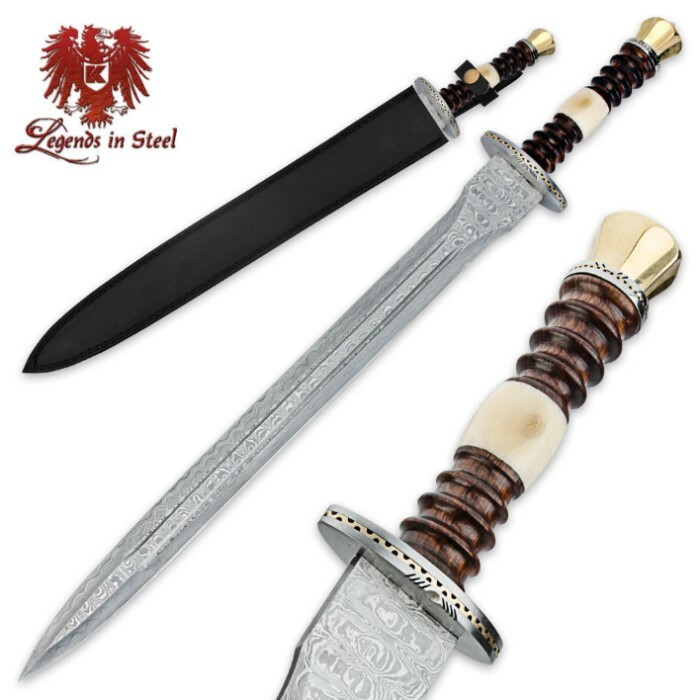 The Medieval Damascus Destroyer sword is an inspired historical collectible that is also functional, with a massive, rock-solid genuine Damascus steel blade with double blood grooves, a sharp edge and a mighty point. 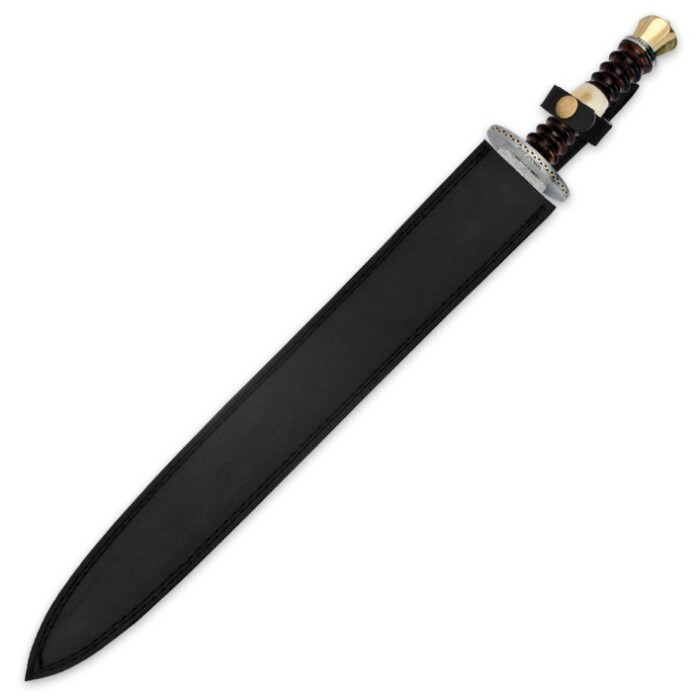 The thick Damascus steel blade would dominate a coliseum fight and command the battlefield. The traditional look and feel continues onto the genuine heartwood and white bone handle, complete with a polished brass pommel. The decorative guard gives this inspired design a high-end, custom look and feel. 25-1/4" overall length. I love this product. Bought it about a month ago and have loved it as a collectors item. Came very sharp out of the box. So sharp that today i accidentally cut my finger open and had to go the the emergency room and get three stitches! I would recomend this product but be very careful with it. Dont cut yourself. 4/5 because my handle gas a little wiggle and there are some parts of the blood grooves have flakes pealing away. Not all damascus is perfect though. This was my first purchase of a REAL sword, and I was not disappointed. 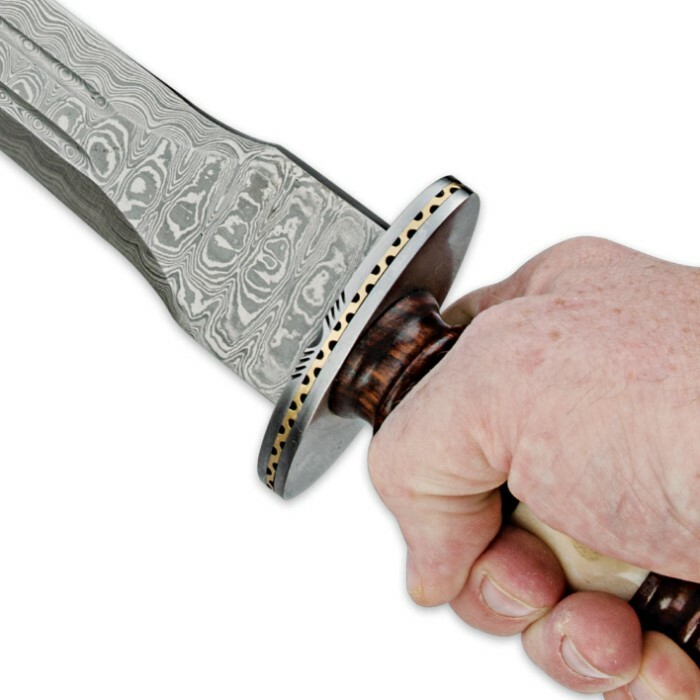 The Damascus blade is lovely and very strong, everything is is fitted together well and nothing is loose. The blade came rather dull though, and the blade is very slightly offset from the handle. Overall, it's a great piece, it will remain on my wall until it requires use. Because I have a deep but discerning appreciation for cutlery, I shied away from this piece for a while. While I thought it looked attractive and the claims sounded alluring, I have been disappointed before. However, I went for it and I'm glad I did so. The entire thing is really pretty and it does look as though it could be applied if necessary. I do wish I had more information about the details of the tang and how much blade metal is down into that handle. I can obviously see no full tang, but does the end of the tail attach to that brass end? This is not razor sharp out of the box, but I can take care of that. I am giving four of five stars mainly because I feel this thing is more about looks than function, but I do suspect the function would be okay if I didn't attempt to beat it apart. I don't expect much more for the cost. Overall, I am happy with this piece and I would recommend it for Ren Fairs, some fun and to be included with a collection of nice cutlery. If you're not expecting a thousand dollar masterpiece, you'll enjoy this one just fine. The sword is smaller than I thought but nicely made. The big problem is the paper thin leather scabbard that starting becoming unstitched in less than a week! Cheapest I ever saw. The blade is a very pretty patterned true Damascus steel and has a nice edge the entire length (though "razor sharp" might be a bit of an exaggeration). There was one small lamination error on the edge of a blood groove, which left an obnoxious tiny steel thorn, which I easily filed off. I am actually surprised I don't encounter this more often, especially when there are two deep blood grooves on each side of 64 layer steel, as several of my swords have this same blade also. The guard and pommel spacer seem to be a very soft steel, both attracting a magnet, but I can scratch them with a pin almost as easily as the brass pommel. The brass pommel, by the way is hexagonal with a point, like the one in the video, not like the rounded one in still pictures. I would have preferred the rounded one, but this shape is growing on me, and I like it a lot, now. The pommel seems to be made of real brass, like the description, not like the video, which says brass plated. When I scratch it with a pin it shows brass color at the bottom of the scratch, so I believe it to be solid brass. I did not scratch very deeply, so I am not certain. I also like the guard and spacer, which I believe to be soft steel with a layer of brass in the center of steel. Very elegant! The handle details are the only real disappointment. The handle is made up of three segments, two pieces of turned wood, with an inch of bone in the middle. It looks uncomfortable, but it really is not bad at all! However, all three segments have defects. The first piece of wood is a little rough and splintery where it touches the guard, Not bad, just not elegant, like the rest of the sword. The bone has a groove-like pit that goes more than half way along its length, and is very visible, but does, I suppose, serve to prove it is bone and not plastic. Finally, the top wood has a thin crack on one side down the whole length. Judging by the polish packed inside the crack, I know this was a defective piece of wood before it was put on, and really should have been rejected. Luckily, all defects are on one side, and are not very visible anyway, so the sword displays very well. It really IS a beautiful sword, worth the money (barely), even with the defects, and I have even considered buying another, in the hope of getting one a little closer to perfect. A defect free sword I would consider to be worth WAY more than the price I paid. Oh, one other thing to mention, The scabbard seemed way too tight, and the sword would not go in all the way. It is constructed of two layers of leather with closed cell foam in between. They put in too wide closed cell foam, so the opening was just too small to fit the last inch of wide thick blade. I fixed it easily by routing it out with a hand drill. However, I overdid it, and now it is very loose. I would have preferred it snug, so if you have to do this little operation, go slow. With better wood and bone it would be 5 stars, easy! As it is, I m trying to decide between 3 and 4 stars. Though a little smaller than I had thought, this is a beautiful sword. Beautiful patterning and the details are nice. Delivery was prompt and trouble free. Highly reccommend. I wasn't too sure about this piece and watched it for a long time. Finally, I put it in my cart but couldn't bring myself to pull the trigger. Eventually I did and when it arrived, I was more than pleasantly surprised! It it beautiful and well made and I cannot wait to show it to friends!